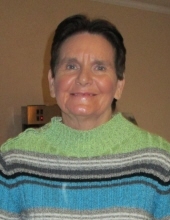 Wilda J. Perry,70, of Conroe, TX was born on April 20,1948 and was called home January, 26, 2019. She was a beautiful and loving soul who was born in Crockett, TX to Ray Henley and Lela Owens. Wilda went on to marry the love of her life, Nathan C. Perry and together they raised four talented, ambitious, and generous children. Wilda was a devoted follower of Jesus, mother, grandmother, and the best cook around! She was always serving others and her passion for life made her a delight to be around. Laughter was always the best medicine for her and she enjoyed the simple things in life. The sweet spirit she had will always make us feel eternally blessed to have known her. Services to celebrate her life will be held Friday, February 8, 2019 at McNutt Funeral Home at 10:00am in Conroe, TX and Viewing will be on Thursday, February 7, 2019 from 6-8pm. Wilda is preceded in death by her husband, parents, and brother Jimmy Henley. She is survived by her sister, Sandra Cole (Bill Cole, husband), brother Richard Henley ( Rhonda Henley, wife), along with her children: Tami and Keith Fester, Malette Biehle and Perry Weaver, Shannon White, David White as well as her grandchildren: Sabrina, Katrina, Keith Jr. (Bubs), Tiffany, April, Michael, Ashley, Matthew, Cassie and Nic. There is numerous great grandchildren and relatives that meant the world to her as well. To send flowers or a remembrance gift to the family of Wilda J Perry, please visit our Tribute Store. "Email Address" would like to share the life celebration of Wilda J Perry. Click on the "link" to go to share a favorite memory or leave a condolence message for the family.